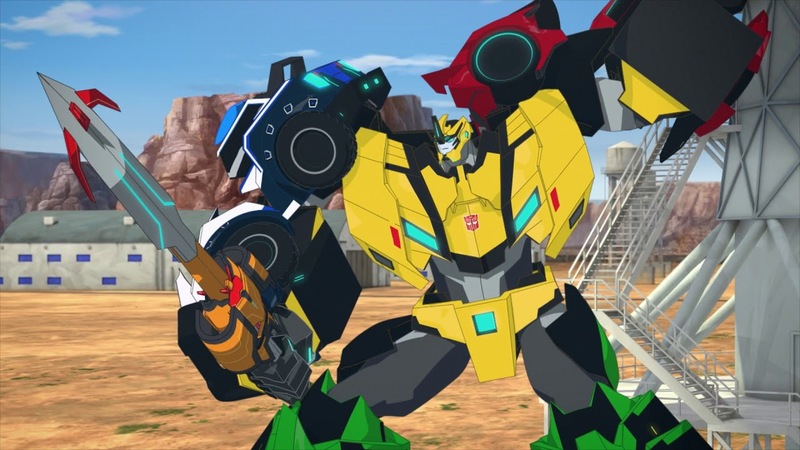 We got some good news for Robots In Disguise fans in Australia. A new DVD release is coming with the Robots in Disguise: Combiner Force – Combine And Conquer DVD. Via Stack Magazine Australia, this new DVD release is scheduled for October 3rd, 2018. The total running time should be 154 minutes (around 7 episodes) similar to a previous Combiner Force DVD we had reported before. No more RID news finally! No need to back out, stay as long as you like. Well Optimus had Ultra Prime and Optimus Maximus. Bumblebee just wanted a Combiner too. He even named him Ultra Bee. Shouldn't be shocked, in fact I'm betting on "Bumble-Cron" being next. Oops, did I spoil Barber's ending? So there's a DVD huh? Ol, digital versatile disc eh? Yeah I know but we all found this out without any time or build up. Not to mention their loss is incredibly predictable. Overall there’s little reason to care about it. I admit they definitely could have paced seasons better, and they could have built up their main events better. However some people ended up thoroughly enjoying the show and some ended up hating every aspect of it. That’s just how it is. I liked it, you didn’t. But regardless it was nice to see a civil discussion about it. Cyclonus wiped the Activators’ memories clean, to ensure no difficulty, but Hi-Test overcame his programming and teamed up with the Bee Team after he learned that Soundwave’s plan to summon Megatron would kill innocents. Soundwave did catch on to Hi-Test defecting, but he couldn’t do anything about it because he was stuck in the ShadowZone. As for the Cyclonus ordeal. Following the War for Cybertron, and Optimus’ sacrifice, a new High Council came into power. Cyclonus’ Group didn’t like them, and wanted to bring back the Decepticons, so they took their bodies and usurped them. Afterwards, they began blacklisting all Autobots and supporters of Optimus Prime to get them far away from Cybertron as possible. While this went on, the Bee Team formed and committed some offenses. Cyclonus used this to his advantage to try and get Bee and his crew arrested. They also began to use mind-control to secure the planet’s support of their plans, by using a specific frequency and broadcasting it on a large scale. Several attempts were made to bring in the Bee Team (hiring Bounty Hunters and sending Strongarm’s superior Dropforge), however Cyclonus had other things to deal with, such as finding out how to bring back Megatron (and team up with Soundwave), along with dealing with the All-Stars (which happened mostly off-screen). After Soundwave failed, they planned to invade Earth without Soundwave and Megatron. Their land were thwarted by the Bee Team and the All-Stars. Oh ok. I just don’t remember that. Also why/how did they help bumblebee’s team? Wouldn’t soundwave catch on or something? That whole cyclonus deal was confusing and predictable anyway. I don’t follow what you mean. The Activators were sent by Cyclonus to assist Soundwave with breaking free from the ShadowZone to summon Megatron. That has something to do with Soundwave. What did the activators even have to do with soundwave? Well I enjoyed the Weaponizer Mini-Cons. They were integrated nicely to coincide with Starscream’s return. Along with the Activators and Soundwave. Both had were executed well in my opinion. Could you list some examples? That is a matter of perspective. While I admit some concepts were shoehorned in there. I found others were really well integrated. Yes but it can be done well. This show did it poorly. You have your opinion, and I have mine. Though forcing toyline ideas into the show is not a new concept. Transformers exists to sell toys. Well cause the characters are boring & don’t change, most of the villains have no personality or character motivations and they force in toy line ideas that mean nothing. I happen to be one of those people that like this show. So what’s there to be confused about? I’m not upset. I’m just confused by the fact that people would like this show.